3 BRING THEM HOME NOW! Michael T. McPhearson... is a leading "peace' activist. 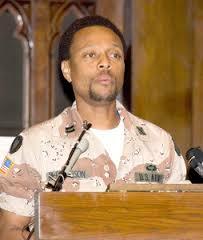 In July 2007 Michael McPhearson representing Veterans for Peace was affiliated to United for Peace and Justice. Another article on the ACLU website provides additional details, saying that McPhearson traveled to Iraq as a Veterans for Peace delegation member in December 2003, attended an international peace conference in Turkey in January 2004, and attended a peace conference in Bologna, Italy, before returning to the U.S.
Bring Them Home Now is a network of U.S. soldiers, their families and veterans who want to protect U.S. men and women in uniform. They believe that the war and occupation in Iraq is unnecessary and immoral and that under such circumstances the only way to be pro-soldier is to be anti-war. As U.S. soldiers and Iraqis die every day, the role of military families, active duty G.I.’s and veterans is key to building an anti-war movement. How is this opposition and the resistance of military people bringing anti-war politics to communities across the U.S.? What is the role of Bring Them Home Now in building a strong and enduring anti-war movement? Can it change the political landscape in the US? A panel of veterans, activists and military families will discuss this growing movement and it’s implications. Michael McPhearson, a native of Fayetteville, NC, was a field artillery officer of the 24th Mechanized Infantry Division during Desert Shield/Desert Storm. His military career includes 6 years of reserve service and 5 years active duty service. Now living in Bloomfield, N.J. and a member of Veterans for Peace, Michael works as an activist and facilitator to help bring about social and economic justice. He is the father of an eighteen-year-old son who is planning to join the Army in September. Dennis O'Neil is an associate member of Veterans for Peace and a postal worker from NYC. The Fayetteville rally for peace was held on March 19th 2005. MCs were Bridgette Burge, Peace LEAP (NC; and Bryan Proffitt, North Carolina Peace and Justice Coalition. Endorsers for the Congress included Michael McPhearson, exec director Veterans for Peace. McPhearson, participated in the 2008 national convention of the Black Radical Congress. In 2010 Michael McPhearson married Deborah Jacobs, executive director of the American Civil Liberties Union of New Jersey. He was working in New Jersey for the National Conference for Community and Justice. More than 100 activists and journalists from a variety of organizations, religious groups and media outlets attended a gathering with Iranian President Mahmoud Ahmadinejad at the Warwick Hotel here Sept. 21. 2010. The leader of the Islamic Republic of Iran was in the city to attend the annual United Nations General Assembly. These prominent leaders of grassroots social justice and human rights movements within the U.S. consciously rejected a well-funded campaign to demonize Iran and whip up a pro-war climate. Ahmadinejad’s visit had been preceded by incendiary billboards, ads in buses and newspapers, hostile media coverage and demonstrations against Iran, much of it funded by the CIA-connected U.S. Agency for International Development and private corporations. After an Iranian-style dinner, the gathering moved to a conference room where representatives from various organizations spoke on the plight of people inside the United States. The displacement of African Americans in the aftermath of Hurricane Katrina, the burgeoning prison-industrial complex, conditions facing political prisoners, the crisis in U.S.-Iranian relations and the overall economic crisis dominated the discussion. Among the individuals and organizations in attendance were Cynthia McKinney, a former U.S. House of Representatives member from Georgia and the Green Party’s presidential candidate in 2008; poet and activist Amiri Baraka; MOVE Minister of Information Ramona Africa; International Action Center co-director Sara Flounders; Ardeshir Ommani and Eleanor Ommani, co-founders of the American-Iranian Friendship Committee; former U.S. Attorney General Ramsey Clark; Million Worker March Movement organizer Brenda Stokely; Shafeah M'Balia of Black Workers for Justice; Phil Wilayto of Virginia Defenders for Freedom, Justice and Equality; Larry Holmes of Bail Out the People Movement; Don DeBar of WBAIx.org; Ryme Katkhouda of the People’s Media Center; Michael McPhearson of United for Peace and Justice; and Rev. Graylan Hagler. Michael Mcpherson is National Coordinator for United For Peace and Justice – the nation’s largest peace coalition. He is the interim Executive Director of Veterans for Peace, and still serves on their board of directors. He resides with his wife in Newark NJ where he works with the People’s Organization for Progress and publishes mcphearsonreport.com. Michael joined the Army Reserve 1981 as an enlisted soldier at the age of 17. He was a field artillery officer in the 24th Mechanized Infantry Division during Desert Shield/Desert Storm, leaving active duty in 1992 as a captain. His son joined the Army and served one tour in Iraq in 2005-2006. In December of 2003 Michael returned to Iraq as part of a peace delegation to examine the state of the occupation firsthand. Organizers of protests planned in Ferguson are determined to see that it's peaceful. They will train people to ensure it stays that way, especially as they plan to close in on and "shut down" the town of Clayton on the first business day after the grand jury announcement on the Michael Brown case. "We, as a community of people, we aren't going to use violent power," remarked organizer Michael McPhearson in a hall meeting of about 100 in St. Louis on Nov. 13. McPhearson is the co-chair of the Don't Shoot Coalition, and addressed the crowd together with Julia Ho, a community organizer with Missourians Organizing for Reform and Empowerment. Meanwhile in Ferguson, a similar meeting was held simultaneously, at Greater St. Mark Missionary Baptist Church. More than half of the diverse St. Louis crowd was present during the initial protests that took place when Brown was shot Aug. 9 by police officer Darren Wilson, according to the St. Louis Post-Dispatch. They agreed that four areas would likely emerge as hotspots for protest going forward: the Ferguson police station; the area near the QuikTrip that was burned the day after the shooting; the Clayton business district; and Shaw, the neighborhood where VonDerrit Myers Jr. was killed by a St. Louis police officer in October. It was suggested goggles and gasmasks be used to protect activists from mace and teargas. Underscoring what he felt was the importance behind the continuing actions, McPhearson said, "We're in a struggle that takes a long time to make things happen. In order for it to be a movement, we have to stay in it." "This is an awards ceremony for activists," said Nicholas James, a Service Employees International Union collective bargaining rep. "This is amazing. Usually, only famous people get awards. That we take the time to recognize the everyday, ordinary people struggling to change our world is what makes this Awards Breakfast so special." Mark Esters, president, Coalition of Black Trade Unionists St. Louis Chapter, and CWA 6355-Missouri State Workers Union lead organizer. Rep. Tommie Pierson (D-69), pastor at Greater Saint Marks Church (in Ferguson), and retired United Auto Workers Union member. James Raines (posthumously), CWA 6355-Missouri State Workers Union organizer, and Peoples' World staff reporter. In a beautiful moment of remembrance, Mark Esters, recounted the amazing life and work of James Raines. A tireless advocate for the working class and a gifted people's reporter, James touched the lives of thousands through his impressive career fighting for a better world. 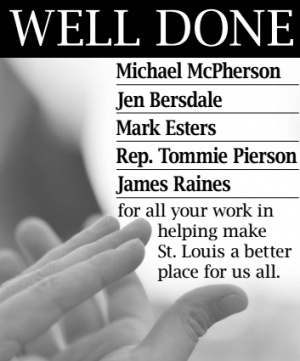 Esters presented his family with the 'Peace and Justice' award as well as a Missouri House Resolution submitted by State Rep. Clem Smith honouring Raines' life, work, and dedication to public service. James is survived by his wife, Wendy, daughter, Emmaline; and parents, Jim and Sue..
March 2015, about a dozen protesters called on the Fed to focus on unemployment, especially among minorities, rather than on keeping inflation rates low. They said if the Federal Open Market Committee raises the interest rate this year, as anticipated, it would likely mean fewer jobs. "We’re calling on the Fed to do the right thing by most people, because the people they’re helping by changing the policy is a very small minority people and a very influential and affluent group of people," said Derek Laney of Missourians for Reform and Empowerment. Jeff Ordower and Michael McPhearson were also involved. The protest was one of several held at Federal Reserve Banks around the country to highlight a new report by the Center for Popular Democracy and the Economic Policy Institute. The report calls on the Fed to focus on “full unemployment,” and highlights disparities between white and minority unemployment levels. With John Chasnoff, Jasmin Maurer, Kirstin Palovick, Sandra Tolbert-Abron, Lauren May, Mike Kinman, Michael McPhearson, Deborah Jacobs, Mustafa Abdullah, Denise Lieberman and Jennifer Knopf Bernstein at Missouri State Capitol. Those invited, on Facebook included Michael McPhearson.